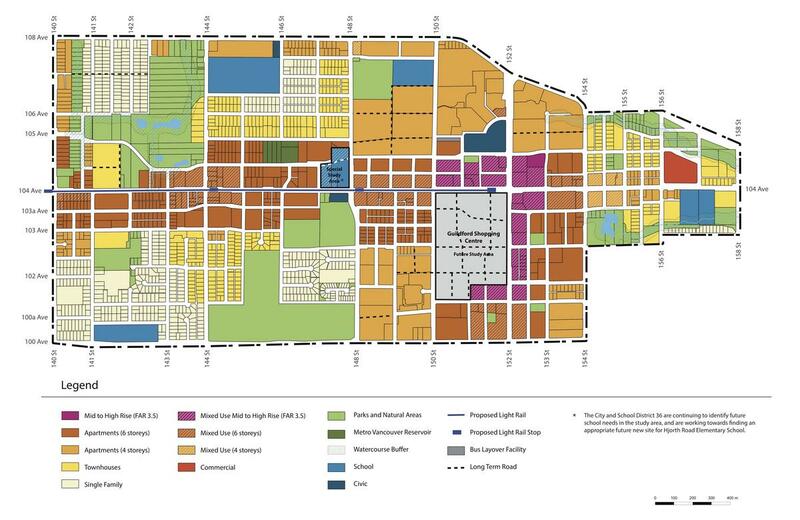 A development application has been submitted for a new mixed-use project on 104 Ave near Whalley Blvd. 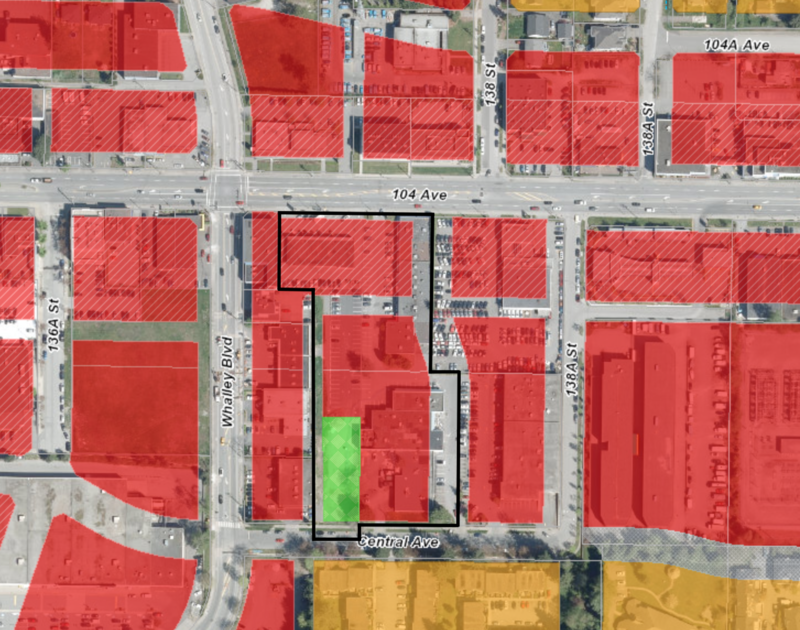 The subject site is made up of 3 existing properties that span the block between 104 Ave and Central Ave just east of Whalley Blvd. 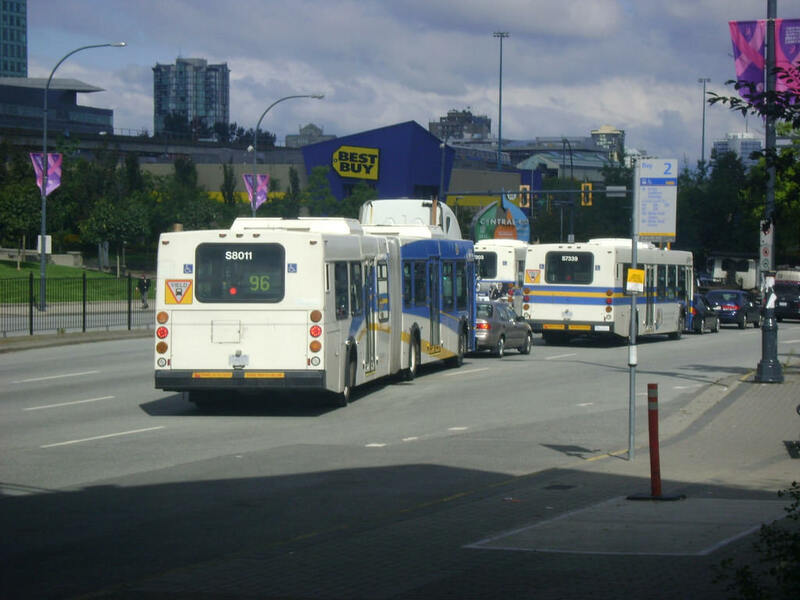 The site is currently occupied by a run-down early 1970’s strip mall known as ‘Plaza 104’. According to details of the development application, the applicant – Andrew Cheung Architects – is seeking to rezone the property and amend both the Official Community Plan and City Centre Plan for increased density from 3.5 FAR to 5.5 FAR to allow for a phased 1149 unit mixed-use development containing 10,720 sq.ft. of commercial space. 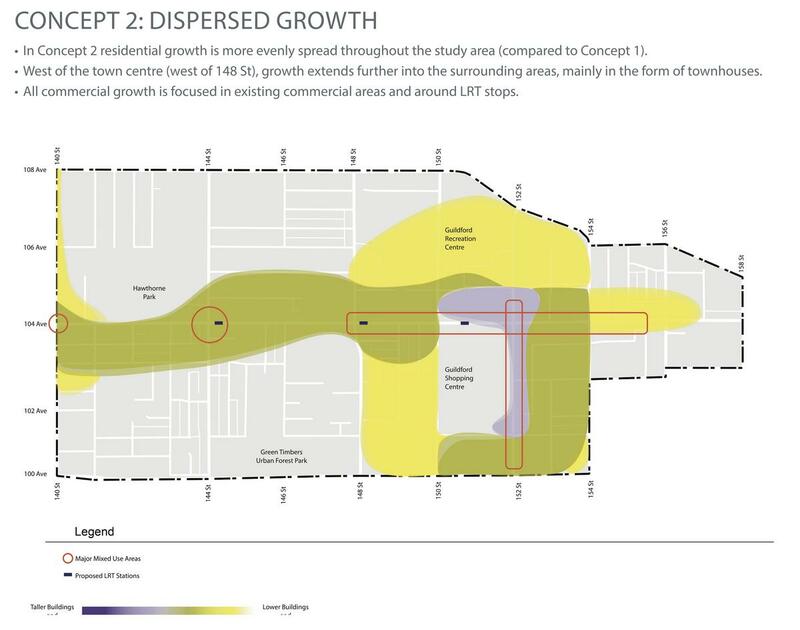 This translates into approximately 3 high-rise residential towers above retail. In addition, the development would dedicate a new north-south road through the site, as well as 2 new lanes as per the City Centre Plan. The current application is seeking a Development Permit for phase 1, which is to contain a single tower (383 units) and all 10,720 sq.ft. of commercial space on a newly subdivided parcel fronting 104 Avenue. 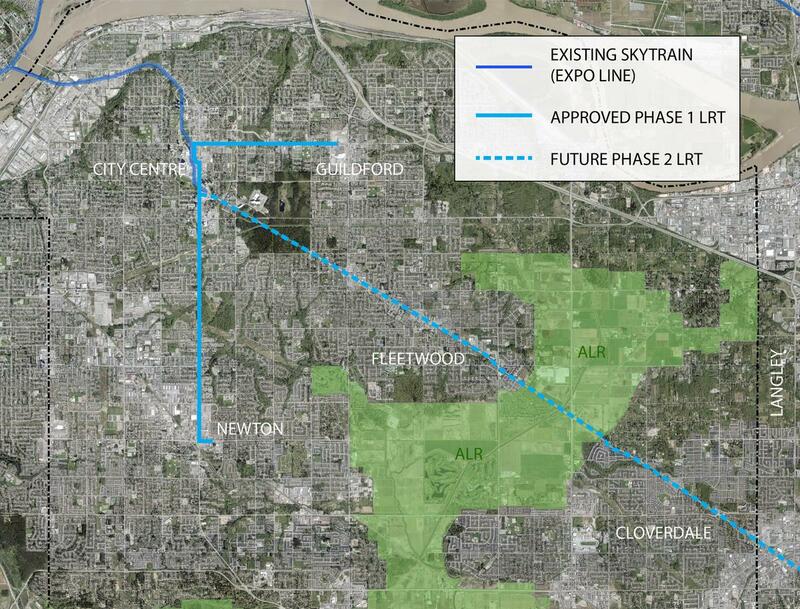 The remaining phases of the project to the south would be subject to future applications. 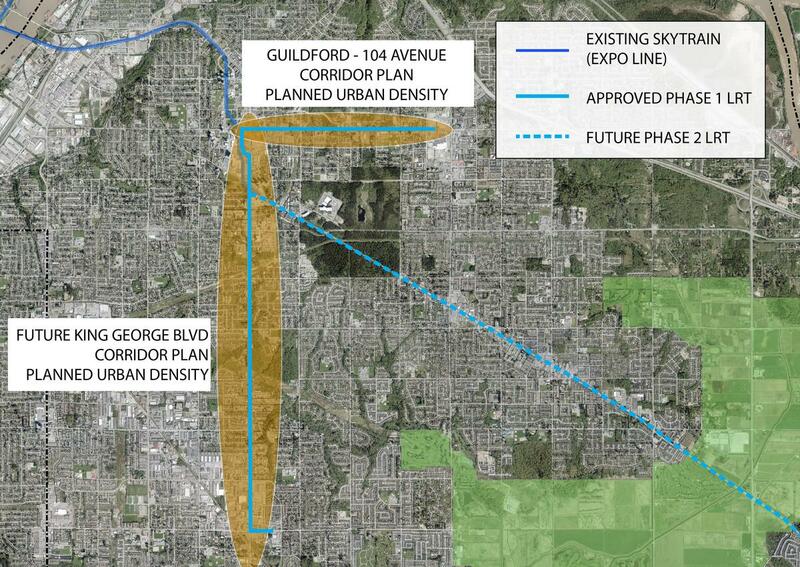 The City of Surrey held a public open house last week on the in-progress, Guildford Town Centre – 104 Avenue Plan. The plan, which has been under study since last year, is seeking to define a vision and prepare a long-range land-use plan to guide future growth along the 104 Avenue Corridor and Guildford Town Centre areas. 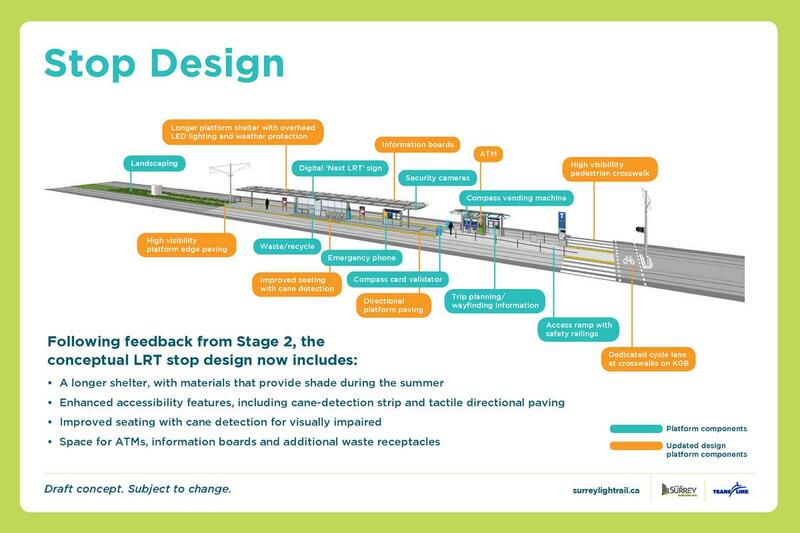 Presented to the public at the open house last week were 2 land-use concept options, along with a proposed street network, bicycle and pedestrian network, and parks and open space concept. Mid to high-rise mixed-use (pink) at 104 Ave & 144 St. 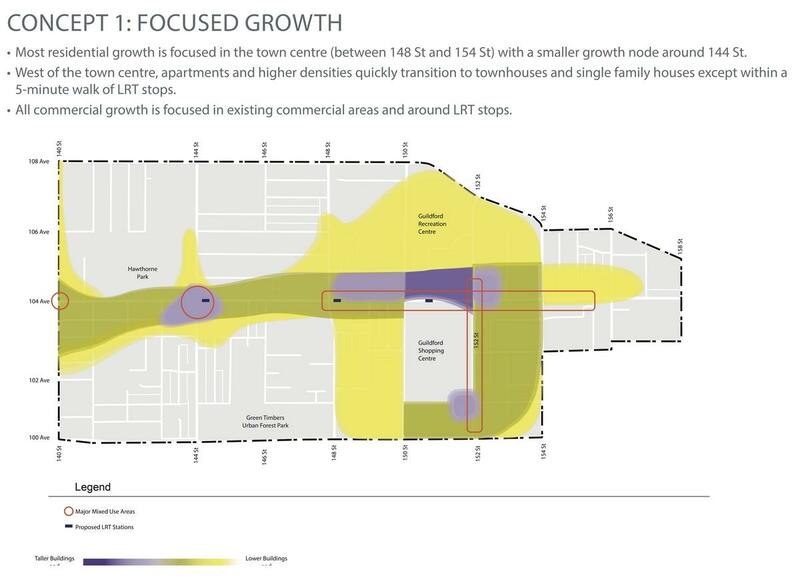 Mid to high-rise along 104 Ave east of 148 St and to the north and east of Guildford Town Centre – with the tallest tower heights (purple) concentrated on the former Sears site. 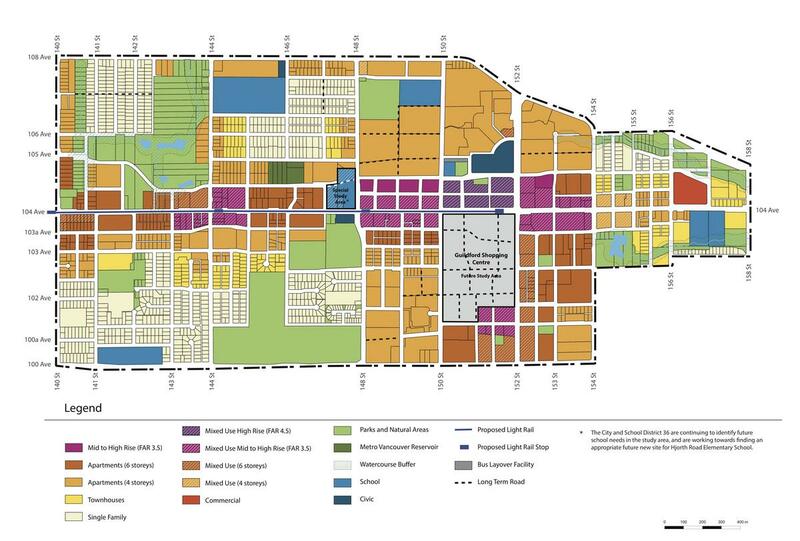 Single Family housing preserved in a number of areas, mostly west of 148 St. Mid to high-rise mixed-use (Pink) to the north and east of Guildford Town Centre. Slightly less preserved Single Family housing. 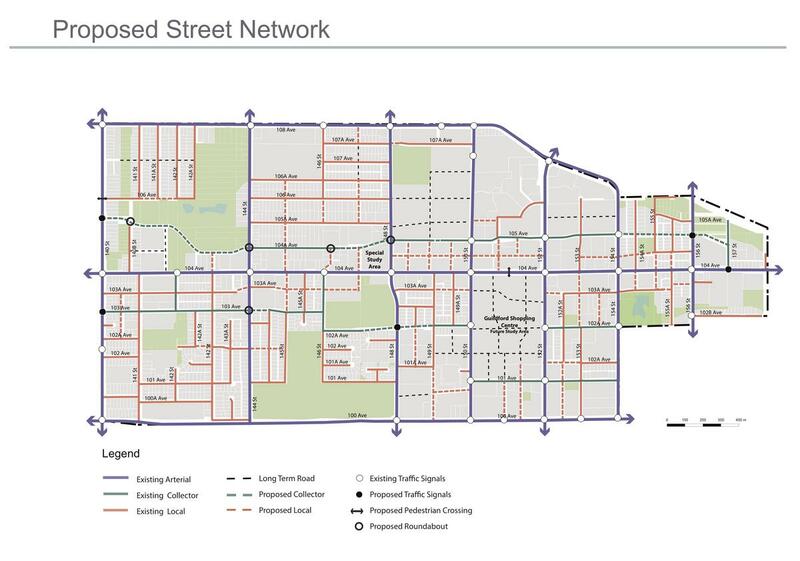 The proposed street network adds a number of new local and collector streets to improve connectivity through a finer-grained network. 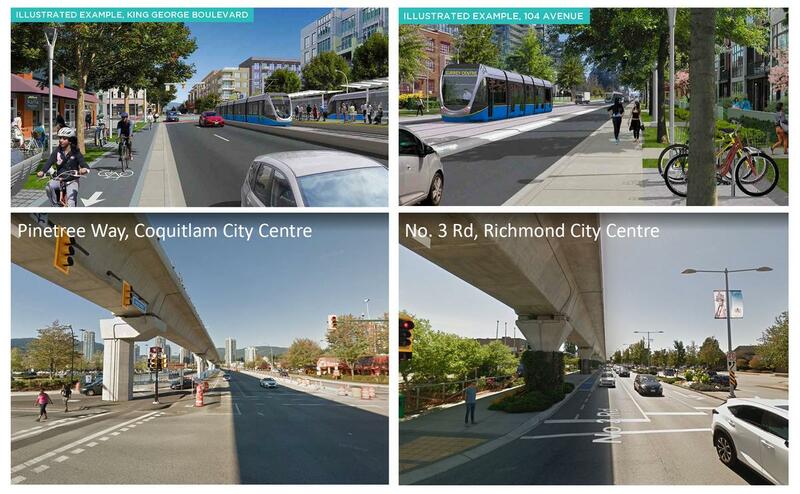 One of these new collectors is the currently underway 105A Avenue connector project which will provide an alternate east-west route to 104 Avenue linking City Centre to Guildford. 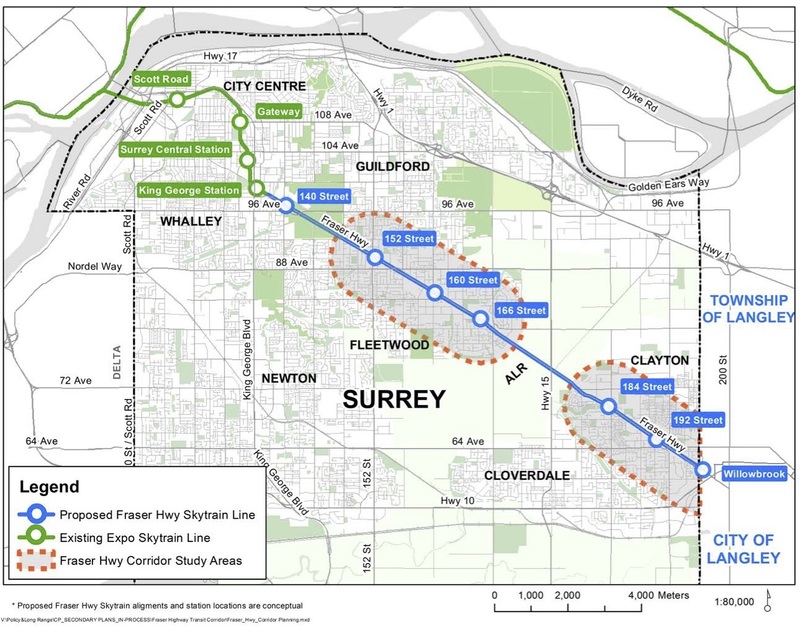 A long-range new street network is shown on the site of Guildford Town Shopping Centre – envisioning the future redevelopment of this mall into an urban district far into the future – similar to the vision for the Metropolis at Metrotown Shopping Centre site in Burnaby under the Metrotown Plan. 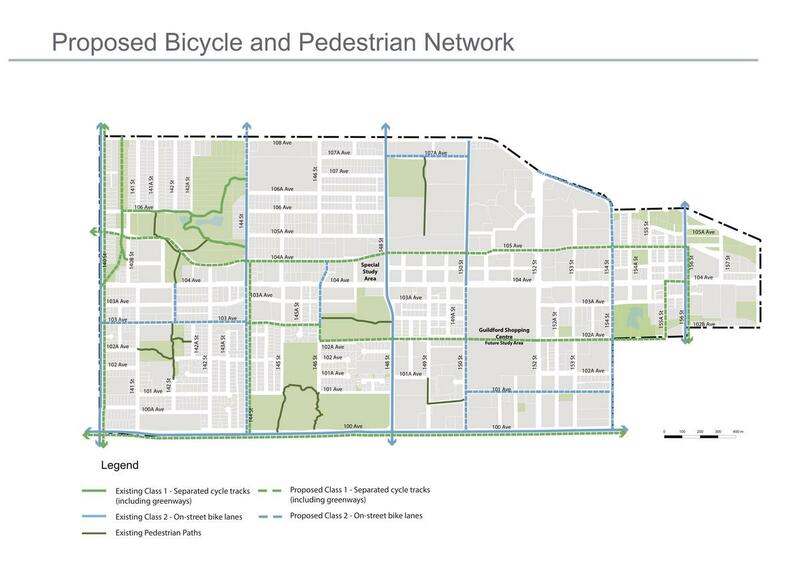 The proposed bike and pedestrian network creates a number of new multi-use paths and road-separated bike lanes improving connectivity throughout the plan area. 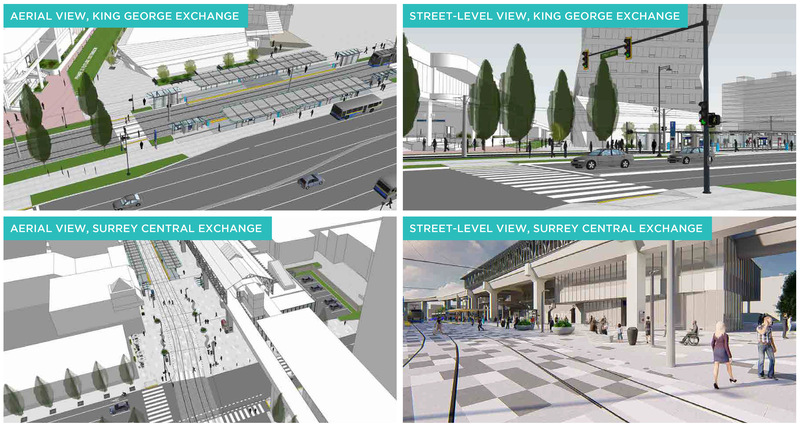 Pedestrian and cycling crossings at busy intersections would be enhanced under the plan to improve safety and streetscape integration. 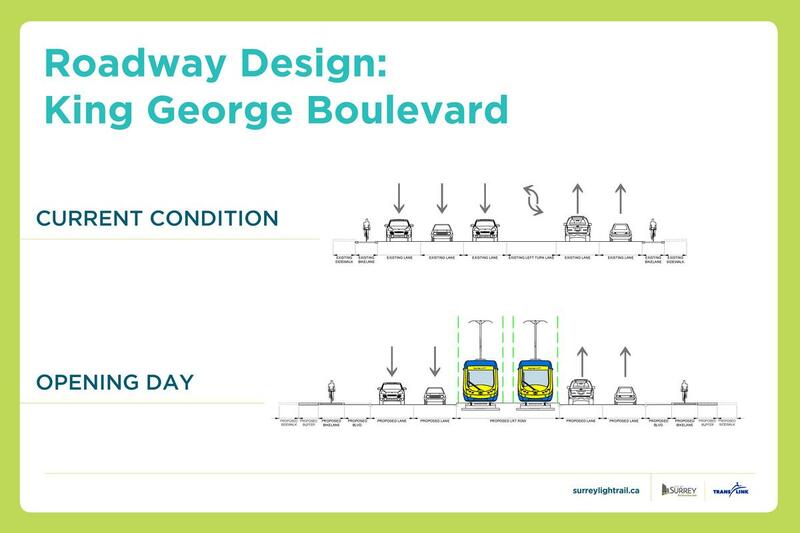 Existing bike lanes would be upgraded to be physically separated from the road. 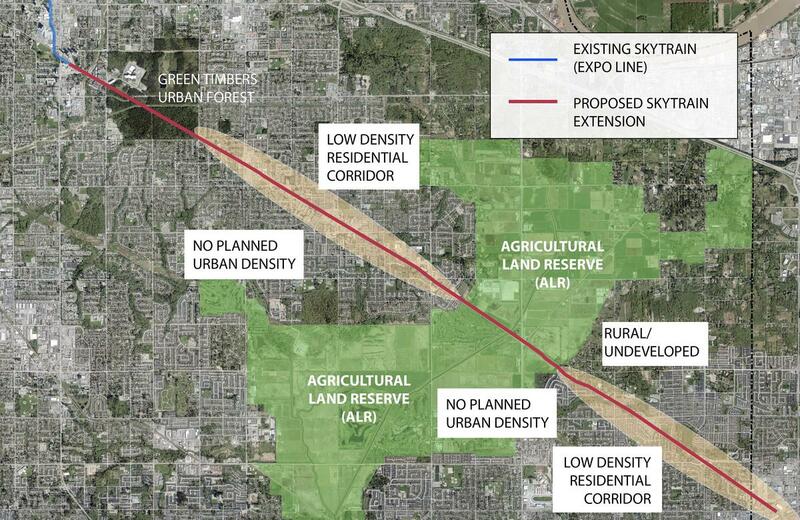 The proposed parks and open space plan illustrates how parks, habitat areas, and the city’s Green Infrastructure Network will be integrated into the plan area. 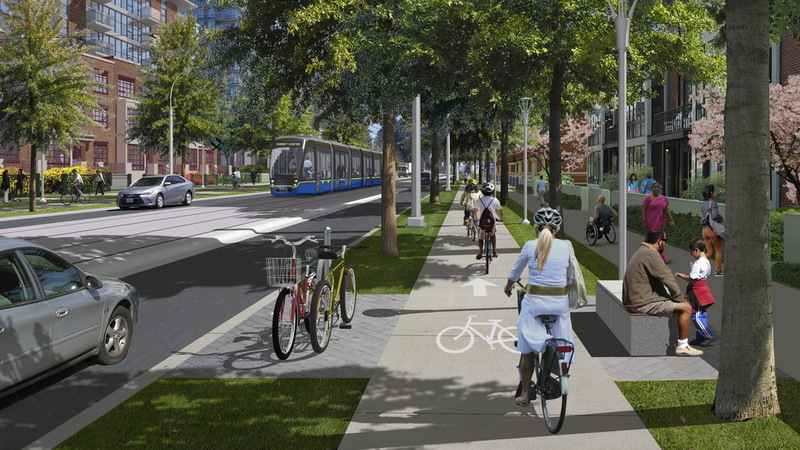 A key feature of the plan is a ‘Green Loop’ pedestrian and cycling network stretching east-west with north-south connections – improving non-automobile connectivity in the area and connecting the many parks. 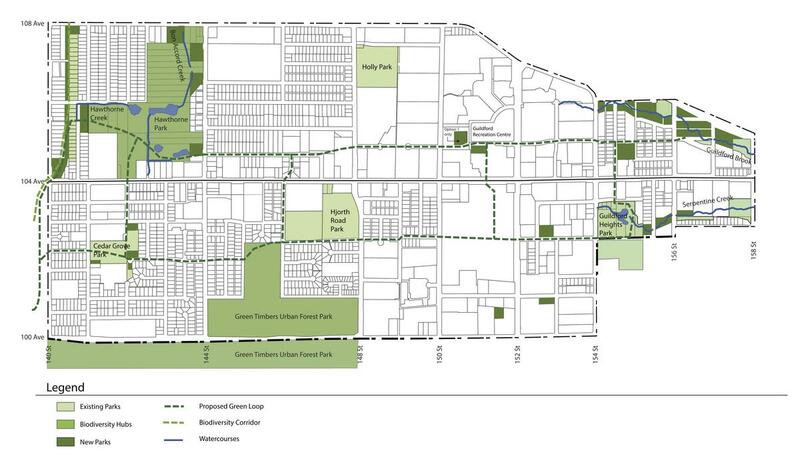 In addition to existing parks shown in light green, many new parks are shown in dark green, including expansions to Hawthorne Park. 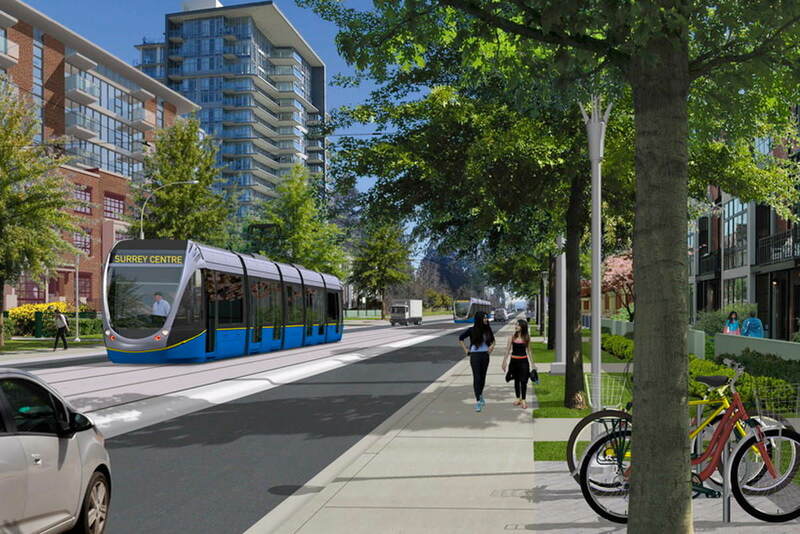 An integral part of the 104 Avenue – Guildford Town Centre Plan area will be the new LRT line linking City Centre to Guildford along 104 Avenue, and further south to Newton. 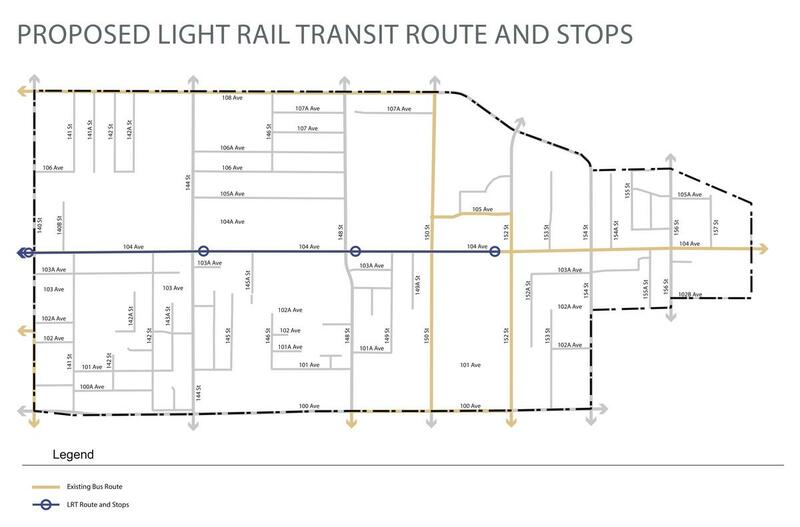 This urban-style, low floor, LRT system will not just be a rapid transit line passing through the area, but a fully streetscape-integrated, centrepiece of the 104 Avenue corridor. 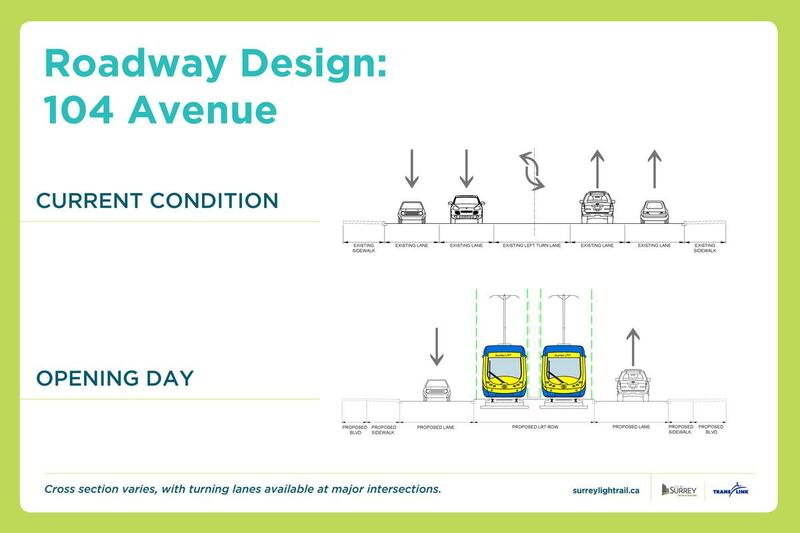 Combined with a continuous 6-storey mixed-use density along 104 Avenue, the corridor will be transformed into a transit/pedestrian-oriented and prioritized streetscape, similar to precedents in Europe and elsewhere around the world. 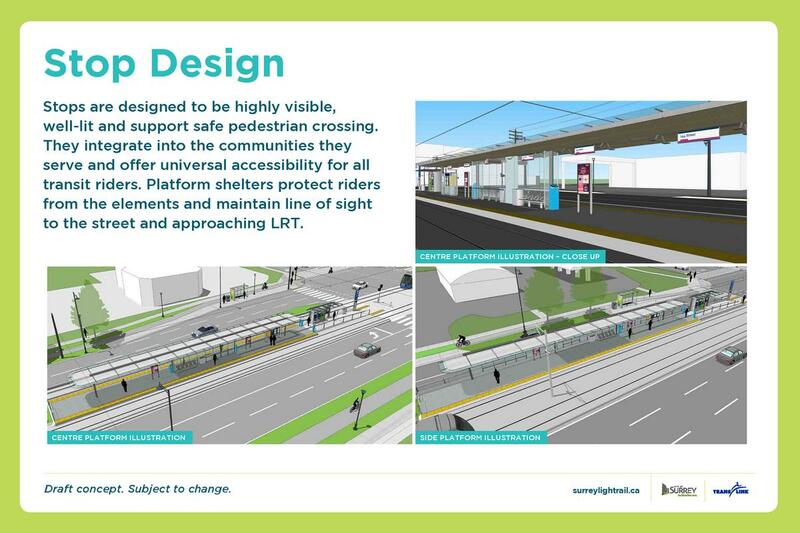 The LRT will support the densities along the the 104 Avenue Corridor, and integrate seamlessly into the community – unlike SkyTrain which bisects and has a negative visual and physical impact on the streetscape.